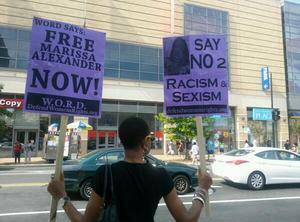 Drop all charges against Marissa Alexander now! Despite the fact that the original guilty verdict was overturned, Florida State Attorney Angela Corey is again moving ahead with the unjust prosecution of Marissa Alexander. A new trial is set to begin March 31, 2014, and will take place in the same venue where she was originally convicted of aggravated assault. Marissa was sentenced, under mandatory minimum sentencing laws, to 20 years in prison in the same state that let George Zimmerman walk free. There is no crime in defending yourself from abuse. Marissa Alexander acted in self-defense and injured no one. She is a survivor of domestic violence, and is only facing charges because of this racist and unjust legal system. Marissa Alexander should not be subjected to a second trial. All charges against her should be dropped immediately. Now is the time to unite and intensify our efforts in spreading the word about Marissa's case and demanding her complete freedom. Across the United States, supporters of Marissa Alexander will be taking action January 18-20 - Martin Luther King weekend - to demand all charges against Marissa Alexander be dropped. Rally begins at 5:00 p.m.
Amistad memorial statue at City Hall on Church St.
*WORD is supporting this event and will participate in the program. Meet at 2295 Adam Clayton Powell Jr. Blvd. (at 135th St.) at 12:30 p.m.
Outreach will begin at 1:00 p.m.
Meet at Sacramento City College, 3835 Freeport Blvd, Sacramento, California 95822, at 8:00 a.m.
March departs at 8:30 a.m.
Assemble at Garfield High School on 23rd St. Assembly: 9:45 am. - 11:00 a.m.
Destination: Covenant Baptist UCC: 3845 South Capitol St. List an event in your city! Also, be sure to sign and circulate the online petition demanding all charges against Marissa be dropped!